It has been suggested that Hanjeungmak be merged into this article. (Discuss) Proposed since February 2018. A jjimjilbang (Korean pronunciation: [t͈ɕimdʑilbaŋ]; Hangul: 찜질방; Hanja: 찜질房; MR: tchimjilbang) is a large, gender-segregated public bathhouse in Korea, furnished with hot tubs, showers, Korean traditional kiln saunas and massage tables. Jjimjil is derived from the words meaning heating. In other areas of the building or on other floors there are unisex areas, usually with a snack bar, ondol-heated floor for lounging and sleeping, wide-screen TVs, exercise rooms, ice rooms, heated salt rooms, PC bang, noraebang, and sleeping quarters with bunk beds or sleeping mats. Many of the sleeping rooms have themes or elements to them. Usually jjimjilbangs will have various rooms with temperatures to suit guests' preferred relaxing temperatures. The walls are decorated with woods, minerals, crystals, stones, and metals to make the ambient mood and smell more natural. The elements used have traditional Korean medicinal purposes in the rooms. Most jjimjilbangs are open 24 hours and are a popular weekend getaway for Korean families. During the week, many hardworking Korean men, whose families live out of the city for cost savings, stay in jjimjilbangs overnight after working or drinking with co-workers late into the night. The cost is around 8,000-12,000 won to enter, and one can sleep overnight and enjoy the bathhouse and sauna. Jjimjilbangs usually operate 24 hours a day. In the entrance, there are the doors labelled “men” or “women” and shoes are to be stored using a given key. Once inside, the shoe locker key is exchanged with another locker key to store clothes and belongings. Afterwards bathers walk into the gender-segregated bathhouse area (children of both genders below seven years of age are free to intermingle) and take a shower. Then, one should wear the jjimjilbang clothes (usually a T-shirt and shorts, color-coordinated according to gender), which are received with the locker key. In the bathing areas, there are kiln saunas with themes including a jade, a salt, or mineral kiln: the dome-shaped inside the kilns are plastered with jade powder, salt and mineral respectively. Often there are several kilns with temperatures ranging from 16 to 49 °C (60 to 120 °F). The temperature of the kilns is displayed on a sign at the entrance. Jjimjilbangs are kept in a very sanitary condition for the health of patrons, and most are cleaned continuously. No harsh chemicals are used in the waters or saunas. But there were cases to be detected with molds or athletes foot germs during the hygiene checking, and also the cases of receiving administrative measure due to the foods over the expiry date. Currently, health control standards are forced to be followed according to Public Health Control Act. Yet, it is better to avoid the patients with cold or fever, or poor general condition. All wet areas prohibit the use of clothing for safety reasons. With the extreme heat of the baths and steam rooms, it is believed that toxic chemicals can leach out of apparel and into the body. It is also believed that if you wear a swimsuit or cover up you may be trying to hide a disease. Recently, the hygienic quality and healthiness of some jjimjilbangs were questioned, especially the proper washing of clothing provided by the jjimjilbangs. Concerns about the clothes increasing atopy symptoms in patients, or even of accidentally hosting parasites, were voiced, although the evidence was inconclusive. Theft, usually of smartphones, is occasionally a problem at some jimjilbangs. In case of the old man, the total amount of sweat become stabilized with a slight increase, and in case of the old woman, the total amount of sweat had decreased. After long-term of Jjimjil, body fat percentage of old woman decreased, but in case of old man, there was no effective change. But, the cold-resisting ability has been decreased. However, if we control the time, power, and the repetition well, especially when we rest in the ice room during Jjimjil. It can reduce the decrease of cold-resisting ability and even we can increase it. Iced Sikhye (식혜) is a sweet rice beverage. Baked eggs (맥반석 계란) are eggs slow-cooked in the hottest sauna. They are eaten like a hard-boiled egg (삶은 계란). 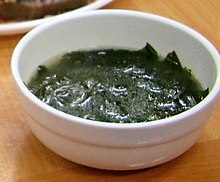 Miyeokguk (미역국) is a soup made from miyeok, a type of seaweed; and typically a mussel based broth. 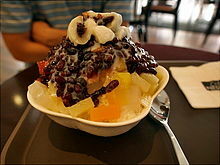 Patbingsu (팥빙수) is a shaved ice dessert with sweet toppings such as chopped fruit, condensed milk, fruit syrup, and Azuki beans. ^ "Naked etiquette: From onsens in Japan to jjimjilbangs in South Korea". Channelnewsasia.com. ^ "Essential Korean Reader". Books.google.co.kr. ^ "Seoul Medical Tourism Guide book: Restore Your Energy Seoul Medical & Wellness". Books.google.co.kr. ^ "How to Enjoy a Traditional Korean Jjimjil bang or Bathhouse". Bemariekorea.com. ^ Milner, Rebecca. "First-time jjimjilbang: how to visit a Korean bathhouse". Lonelyplanet.com. Retrieved 23 June 2016. ^ "Guidebook for Living in Korea". Books.google.co.kr. ^ "찜질방서 곰팡이, 무좀균까지…위생관리 '빨간불'". Hani.co.kr. 10 June 2010. Retrieved 8 September 2018. ^ "≪신문고뉴스≫ 강남 3개 찜질방 식품위생법 위반 등으로 적발돼". Shinmoongo.net. 24 June 2010. Retrieved 8 September 2018. ^ "별표·서식". Law.go.kr. Retrieved 8 September 2018. ^ "남동경찰서, 찜질방내 스마트폰 도난 예방법 - 국제뉴스". Gukjenews.com. 20 February 2015. Retrieved 8 September 2018. ^ Wha, Choi Jeong; Young, Song Eun; Kyung, Hwang Soo. "The Effects of Regular Jjimjilbang Exposure on Cold Tolerance in Young and Elderly Females". The Korean Journal of Community Living Science. 18 (4). Retrieved 8 September 2018. ^ Park, Joo-Hee; Hwang, Soo-Kyung; Choi, Jeong-Wha. "Relationships between Heat Tolerance and Cold Tolerance during Continuous Exposure to Various Jjimjilbang". Journal of The Korean Society of Living Environmental System. 17 (4). Retrieved 8 September 2018. Wikimedia Commons has media related to Jjimjilbang.